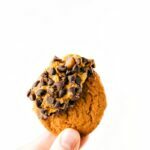 A delicious and simple no bake pumpkin cheesecake ball with toffee!A delicious and simple no bake pumpkin cheesecake ball with toffee!A delicious and simple no bake pumpkin cheesecake ball with toffee! A delicious and simple no bake pumpkin cheesecake ball with toffee! After having my first baby, I was very curious what all the “hype” of “baby proofing” was all about. My first baby never got into anything he wasn’t supposed to. If he got near an outlet and I said no, he’d never go by it again. Stairs? Never even tried to climb them. Oven? He steered clear. He never put random things into his mouth either. If he did happen to shove a pebble or piece of plastic in, he’d spit it out immediately and never try it again. But usually he’d only eat what we gave him. I completely did not understand locking cupboard doors, using a gate for the stairs, outlet covers, or watching him too closely/nervously when playing with smaller objects. And now, all is right in the world I suppose, because my 1-year-old could not be more opposite. From the second he could crawl he’s made a bee-line for the stairs, the outlets are his favorite place to explore, he has no concept that an oven will burn him, and he puts EVERYTHING and ANYTHING into his mouth. And not only does he put everything in his mouth, he continues to shove these things in despite the obvious discomfort of some of the objects. When we went to Moab a few weeks ago, I was constantly pulling ridiculous amounts of pebbles out of his mouth. But he just kept shoving them in. What took the cake though was what we found in his mouth a few days ago. We decided to go out to dinner as a family and then do a little clothes shopping. With two little boys I very rarely shop for any clothes. ….Unless you count online and well, that’s a different story…. We went to one of my favorite stores and the husband entertained the kids while I tried something on. When I came out of the dressing room I looked at my husband holding Bentley (who was facing towards me) and noticed he was chewing on something. I went over and fished out…wait for it… A BAND-AID from his mouth. Yes, someone else’s bloody bandaid was almost swallowed by my baby. ? Sure enough the husband had let him get down for one second and that was what he decided to shove in his mouth. Aaaand a day later, I found him chewing on his brother’s band-aid, so clearly he didn’t learn how disgusting they are. Needless to say, baby proofing is a must in my home these days. We own a baby gate, every outlet is covered, we have door locks, cupboard pulls, and boxes holding little objects all out of his reach. Regardless of all the baby proofing, he still finds his way around. 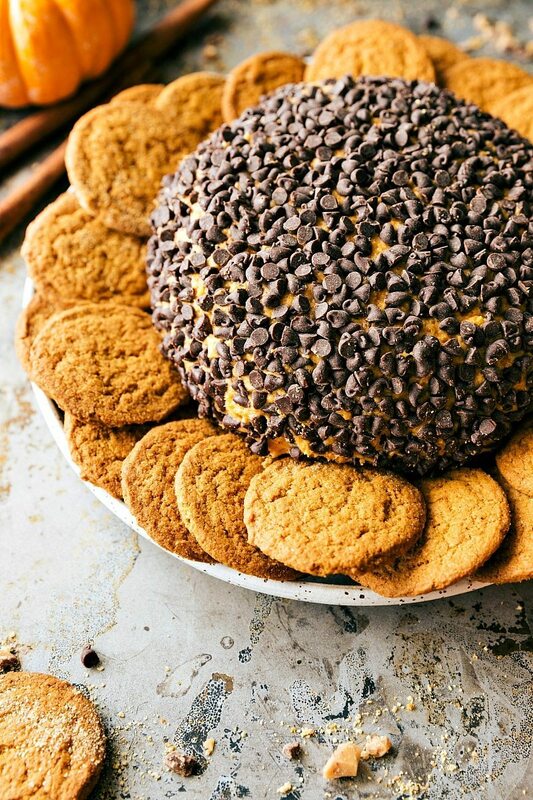 For example, to this pumpkin cheesecake ball. He found this perched on the table and decided it would be fun to pull the entire thing off and smash it like play-dough. In the five minutes I was away helping his brother, I came back to find this dip covering the floor, walls, and his face. That kid works fast! However, the amount filling his mouth tells me one thing — this is baby approved! ? Luckily I’d already snapped a few shots of this one, but I had to make it again so we could all enjoy it for dessert. The next time I made it, I coated it in cinnamon graham cracker crumbs which was also delicious. 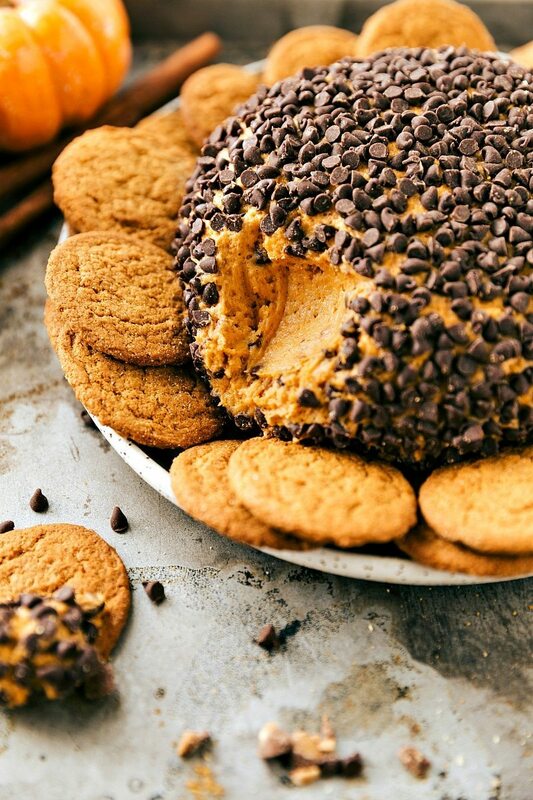 If you don’t like chocolate with your pumpkin desserts, try graham cracker crumbs! 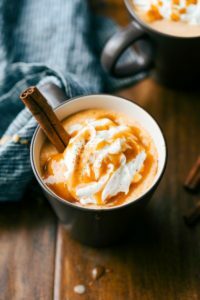 Beat together the room temperature (do NOT melt) cream cheese and butter, vanilla extract, and pumpkin pie spice until completely smooth. Add in the pumpkin, powdered sugar, brown sugar, food dye (if desired for a more intense orange color), and pumpkin spice cake. Beat until all ingredients are well incorporated. If needed, add a bit more spice cake mix if the mixture is too wet. If you use the right products at the right temperature you shouldn't need to add more than a tablespoon or two. Note that it will firm up quite a bit during chilling time. Form into a ball and wrap tightly with plastic wrap. Chill in the fridge for 2 hours or until firm. 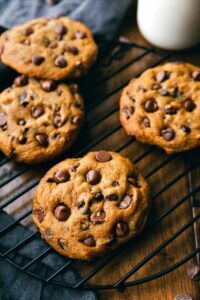 Remove and coat in miniature chocolate chips. 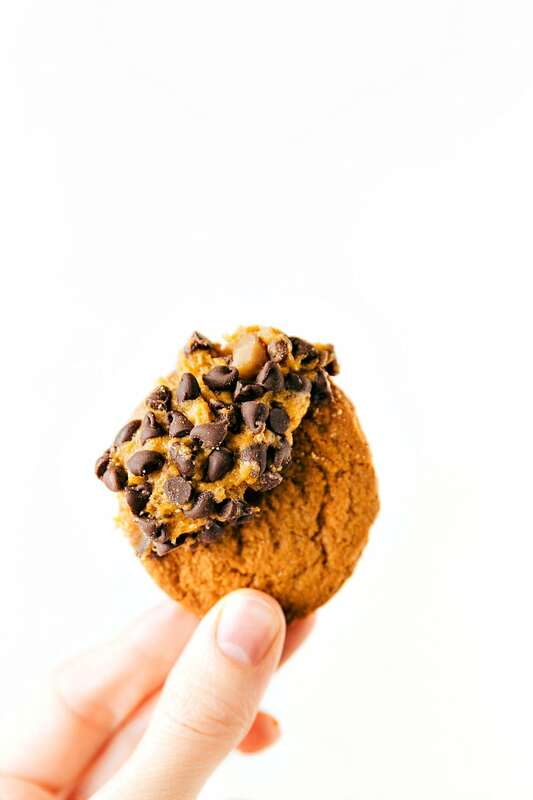 Serve with your favorite cookies/crackers -- cinnamon graham crackers or gingersnaps are our favorites. *Do not use a lower fat or spreadable cream cheese as this won't set up. Use real butter. Both should be at room temperature and not at all melted for best results. **Use a thicker canned pumpkin (it shouldn't be watery at all) I prefer Libby's canned pumpkin for consistency. ***Cook time refers to chilling time and time required to bring the butter and cream cheese to room temperature. 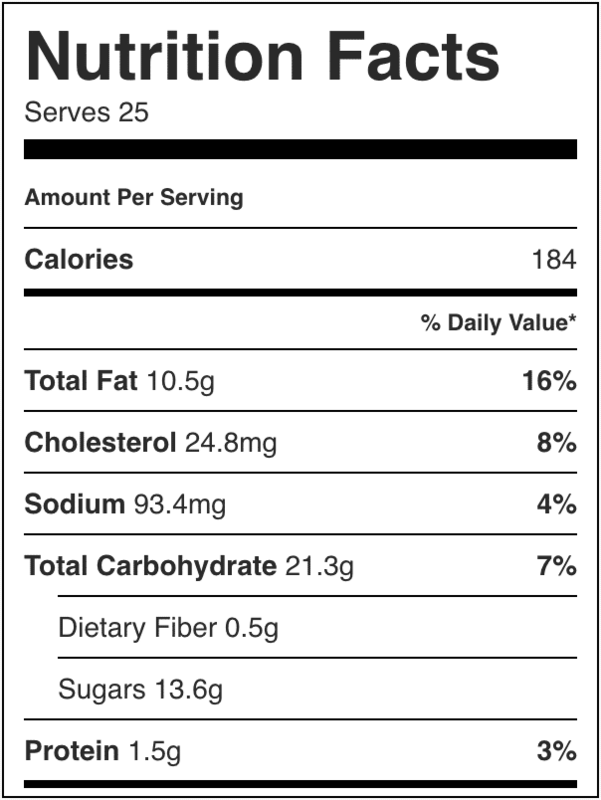 The nutrition facts are just on the dip; add in whatever cookies/crackers accordingly! I made this for a church potluck, and it was an absolute hit!!! So many of the ladies asked me to share the recipe, I couldn’t write it down that much! I’m printing it off today for them. 😀 Thank you for so many delicious recipes! 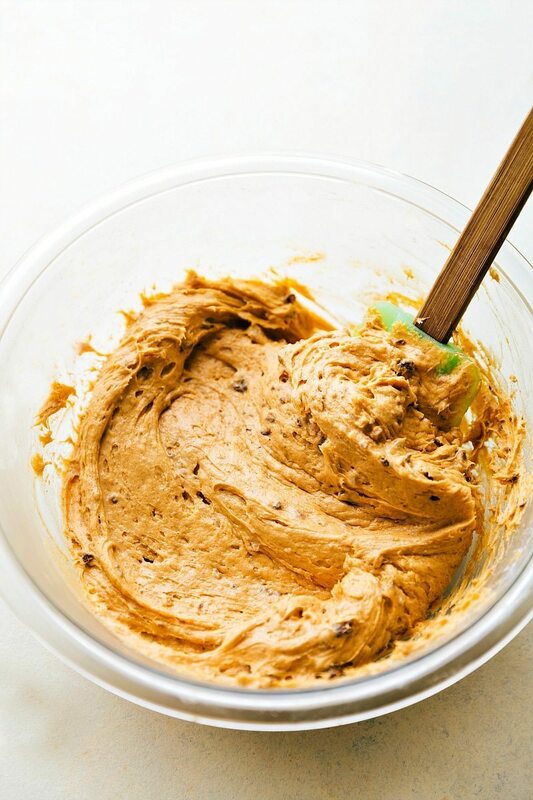 sure would love to print the pumpkin cheeseball recipe but when i hit the print button it doesnt do anything…….UGH!!!!!! I’m so sorry Cindie. I’ll have my web developers look into it. In the meantime, you might want to try a different browser or you could copy and paste the recipe into a word document and print it that way. Hahaha! Yes fair enough 🙂 Hope you love it! I just made this for a party I’m going to tomorrow and it’s simply amazing! I will be making this for years to come. Thank you for sharing! What size can of pumpkin are you referring to? There are many different sizes and I don’t want to mess it up. Could I make it the night before and it still be good? This cheesecake ball looked amazing and tasted even better! It was a huge hit at the bridal shower at which I served it. I made it the day before the shower, so waited until that morning to stir in the toffee bits so they wouldn’t be too soft. It was a little difficult to shape into a ball because it was pretty sticky, and even stickier when I unwrapped it to roll it in the chocolate chips before setting it out, but it worked! I buttered my hands to keep them from sticking too badly when I shaped it into the ball and that helped. I served it with apples, as well as graham crackers and gingersnaps, and I think I liked the apples best, especially a sweet-tart apple like Honeycrisp or Johnathan. It was a bit addicting, and loved by all who had it!